Edward Drinker Cope (July 28, 1840 – April 12, 1897) was an American paleontologist and comparative anatomist, as well as a noted herpetologist and ichthyologist. He discovered and named many fossils, and was a regarded as a brilliant scientist. He published more than 1,200 scientific papers, a record that he holds to this day. E. D. Cope was particularly well known for his competition with Othniel Charles Marsh—the so-called Bone Wars. Their fierce rivalry to discover, describe, and name fossils, discovered mostly in the American West, resulted in the finding of numerous new species of dinosaurs. However, their animosity and desire for the glory of finding and naming spectacular fossils also manifested in efforts to destroy each other's reputation and a rush to publish and describe organisms, which resulted in notable errors. There were also allegations of bribery, spying, stealing of fossils, and treaty violations, and it is even claimed that Marsh dynamited a fossil site rather than let it fall into Cope's hands. While Cope and Marsh's discoveries made their names legends and helped define a new field of study, they are also renowned for their less noble actions. Their public behavior harmed the reputation of American paleontology and it is not known how many critical fossils were destroyed. These strange creatures flapped their leathery wings over the waves, and often plunging, seized many an unsuspecting fish; or, soaring, at a safe distance, viewed the sports and combats of more powerful saurians of the sea. At night-fall, we may imagine them trooping to the shore, and suspending themselves to the cliffs by the claw-bearing fingers of their wing-limbs. Cope was born in Philadelphia to Quaker parents. At an early age, he became interested in natural history, and in 1859 communicated a paper on the Salamandridae to the Academy of Natural Sciences at Philadelphia. It was about this time that he became affiliated with the Megatherium Club at the Smithsonian Institution in Washington, D.C. He was educated partly in the University of Pennsylvania and, after further study and travel in Europe, became professor of natural science at Haverford College in Pennsylvania, a position he served in from 1864 to 1867. In 1865, he also was appointed curator to the Academy of Natural Sciences, a post which he held until 1873. 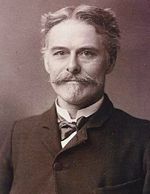 In 1889, Cope was appointed professor of geology and paleontology by the University of Pennsylvania. Cope's specialty was the study of the American fossil vertebrates. From 1871 to 1877, he carried on explorations of the Cretaceous strata of Kansas, and the Tertiary in Wyoming and Colorado. He made known at least 1,000 new fossil species in his lifetime, as well as many genera of extinct vertebrates. Among these were some of the oldest known mammals, obtained in New Mexico, and 56 species of dinosaur, including Camarasaurus, Amphicoelias, and Coelophysis. Cope served on the U.S. Geological Survey in New Mexico (1874), Montana (1875), and in Oregon and Texas (1877). He was also one of the editors of the American Naturalist. Cope died in Philadelphia on April 12, 1897, at the age of 56 years old. He requested in his will that his remains be used as the holotype of Homo sapiens. Some efforts were made in this direction, but the skeleton was found unsuitable to be a type specimen due to disease. Later, W. T. Stearn (1959) designated Linnaeus himself as the lectotype of H. sapiens. Maverick paleontologist Robert Bakker declared his intention to describe Cope's skull as a type specimen, but never published this. A 1994 book by Louis Psihoyos attributed a supposed citation to Bakker in The Journal of the Wyoming Geological Society, but this does not exist. Such a publication, even if it did exist, would have been invalidated by Stearn's prior designation, but—to make matters more confusing—the International Code of Zoological Nomenclature (which did not exist until 1961) also invalidates Stearn's designation, and makes it altogether impossible for a neotype to be validly designated for H. sapiens (ICZN Article 75.3). Cope's competition with Othniel Charles Marsh for the discovery of new fossils became known as the Bone Wars. The Bone Wars began in the marl pits of Haddonfield, New Jersey, with the 1858 discovery of a nearly complete skeleton of a dinosaur, Hadrosaurus foulkii. The skeleton was sent to the Academy of Natural Sciences in Philadelphia, were it was named and described by Joseph Leidy, a paleontologist for whom E. D. Cope worked. Soon E. D. Cope and Leidy were working in these marl pits and made some important discoveries, including an almost complete skeleton of a carnivorous Dryptosaurus aquilungis. The marl was being dug up by companies to be used as fertilizer, and Cope and Leidy made arrangements that they be contacted should any fossilized bones be unearthed. O. C. Marsh visited Cope, who he knew from the University of Berlin, and together he and Cope unearthed some new partial skeletons. However, the rivalry commenced when Cope learned that Marsh had secretly returned and bribed the marl company managers to report any new finds directly to him. From that point, until Cope's death, Cope and Marsh were bitter rivals. Much of competition centered in the Morrison Formation, a site in the American West that has proved to be a most fertile source of fossils. Both Cope and Marsh strove to destroy the other's reputation. When Cope made a simple error, and attached the head of an Elasmosaurus to the wrong end of the animal (the tail, instead of the neck), he tried to cover up his mistake. He even went so far as to purchase every copy he could find of the journal it was published in. But Marsh, who pointed out the error in the first place, made sure to publicize the story. Marsh also got Cope's federal funding cut off, including his funding from the U.S. Geological Survey. Cope accused Marsh of stealing fossils, and at one point was so angry that he stole a train full of Marsh's fossils and had it sent to Philadelphia. Details of the rivalry are recounted in Bone Wars. The competition ended only with the death of Cope. By that time, he had run out of money, and had to sell part of his collection. Although Cope is widely regarded as the more brilliant scientist (but brash and careless), by all accounts Marsh won the competition. Marsh found more fossils (86 new species of dinosaurs to Cope's 56) and more prominent fossils. While Cope found Dimetrodon, Camarasaurus, Coelophysis, and Monoclonius, Marsh's findings were household names like Triceratops, Allosaurus, Diplodocus, and Stegosaurus. The work of Cope and Marsh greatly advanced paleontology. But in the process, the public acrimony and behavior of Cope and Marsh damaged the reputation of American paleontology and resulted in fossils being destroyed as well. The rush to publish, name, and display specimens resulted in errors, some of which were not corrected for a hundred years. Cope is also known for "Cope's rule." Cope's rule states that population lineages tend to increase body size over geological time. The horse family, Equidae, is often used to illustrate the rule, with small animals evolving into larger ones. However, critics such as Stephen Jay Gould point out a number of shortcomings of this example. Cope's rule is interesting because it appears to make the apparently paradoxical suggestion that possession of large body size favors the individual but renders the clade more susceptible to extinction. Cope's rule, or the evolutionary trend toward larger body size, is common among mammals. Large size enhances the ability to avoid predators and capture prey, enhances reproductive success, and improves thermal efficiency. Moreover, in large carnivores, interspecific competition for food tends to be relatively intense, and bigger species tend to dominate and kill smaller competitors. Progenitors of hypercarnivorous lineages may have started as relatively small-bodied scavengers of large carcasses…. A significant trend toward larger size has been documented for large North American mammals, including both herbivores and carnivores, in the Cenozoic. Cope's rule has come under sustained criticism, including the observation that counterexamples to Cope's rule are common throughout geological time. Critics also point out that the so-called rule is worthless without a mechanism. Cope, E. D. 1870. On Elasmosaurus platyurus Cope. American Journal of Science 50(148): 140-141. Stearn, W. T. 1959. The background of Linnaeus's contributions to the nomenclature and methods of systematic biology. Systematic Zoology 8: 4–22. Valkenburgh, B. V., X. Wang, and J. Damuth. 2004. Cope's rule, hypercarnivory, and extinction in North American canids. Science 306(5693): 101-104. History of "Edward Drinker Cope"
This page was last modified on 22 September 2017, at 20:40.